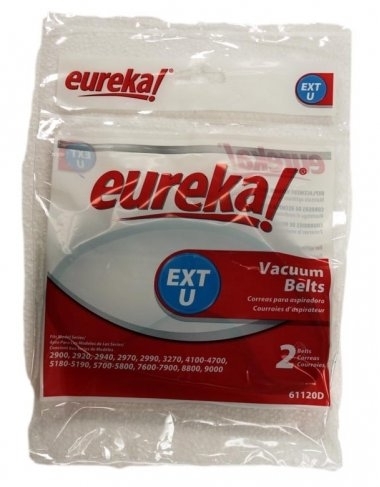 Eureka EXT-U Vacuum Belts #61120 (set of 2) for use in many Eureka upright vacuum cleaners. Is your vacuum not picking up as well as you remember? Do you have a Eureka or Sanitaire vacuum that just isn't doing the job? It might be clogged, the bag might be full, or your belt may need replacement. Vacuum belts stretch over time, and as their tension lessens they will have a tendency to slip and fail to turn your vacuum cleaner's brush roll. Sometimes, while vacuuming, your vacuum cleaner's rotating brush may stop abruptly when traveling over loose items and cause the belt to break. 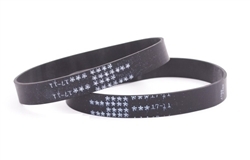 Use Eureka EXT-U vacuum belts #61120 to get your vacuum back in top running shape. This set replaces style U belts and part numbers 61120A, 61120B, 61120C, 61120D, 61120F, 61120G.